Unlike other aftermarket warranties, Callaway provides a comprehensive warranty program that works in tandem with General Motors’ OEM warranties, providing seamless coverage of both Callaway and GM installed components during the term of GM’s Bumper-to-Bumper Warranty. In the rare occasion that a Callaway car or truck requires attention by a GM dealer to address a warranty-related problem, GM and Callaway work together to return the vehicle to its owner as soon as possible. For 36 months or 36,000 miles from the vehicle in-service date or mileage (whichever comes first) Callaway assists the dealer to conduct a timely diagnosis of the problem. Callaway will then supply any required Callaway replacement parts and technical support, and reimburse the dealer for the dealership’s labor cost. Plus, if failure of a Callaway component should result in damage to covered GM powertrain parts, Callaway will also reimburse the dealer for those parts and labor as well. For extended protection of Callaway and GM drivetrain components, Callaway offers an Extended Powertrain Service Contract that matches the term of the GM factory 5 year, 60,000 mile powertrain warranty. While the coverage is limited to drivetrain-related parts, the program is administered as the Callaway Limited Warranty. For further details regarding Callaway warranty policy or the Extended Powertrain Service Contract, please call Callaway Cars at 860 434 9002, 8AM-5PM, Eastern US time, Monday through Friday. Click on image below to view full size, print or download. This Limited Warranty is issued by Callaway Cars Incorporated (Callaway), assembler of modified GM vehicles and applies only to vehicles modified at Callaway facilities. The Limited Warranty period is 36 months or 36,000 miles (60,000 km), whichever occurs first, from the retail delivery date of the vehicle recorded by GM. This Limited Warranty is only in effect concurrent with the term of the GM 36 month/36,000 miles (60,000 km) Bumper-to-Bumper New Vehicle Limited Warranty. See your GM dealer for GM warranty details on non-Callaway components. Callaway warrants to the original retail purchaser of a Callaway-modified vehicle that Callaway-installed Callaway Components are free of defects in material and workmanship. This Limited Warranty is transferable to subsequent vehicle owners. Callaway will recognize the owner of record in the GM vehicle data system as the owner entitled to Limited Warranty benefits. Warranty repairs will be made by any Callaway-approved repair facility if the vehicle is returned to a Callaway-approved repair facility during the Limited Warranty period. Callaway-Installed Callaway Components found to be defective in material and/or workmanship will be repaired or replaced at no charge to the vehicle owner. Replacement Callaway Components will be covered for the balance of this Limited Warranty. Effecting repairs to, or replacement of defective Callaway Components is the only remedy offered under this Limited Warranty. 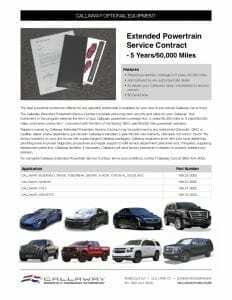 This Limited Warranty is valid only for vehicles registered and operated in the fifty (50) United States, the District of Columbia or the Thirteen Provinces of Canada and is not offered elsewhere. Vehicle scheduled maintenance required to keep the GM warranty in effect is required to keep this Limited Warranty in effect using any severe use schedules if required based on type of use. GM vehicle scheduled maintenance costs. Tires are covered by tire manufacturers and not covered by this Warranty. Callaway-Installed brake pad wear, if applicable. Consequential damage to, or failure of, original or aftermarket vehicle components or accessories not installed by Callaway, except for GM Powertrain Coverage included below. Subsequent alteration or modification of the vehicle including, but not limited to, alteration of the engine management system and/or intake pressure delivered by the supercharger. Any outside influence such as but not limited to accident, misuse, impact, environmental damage, fire, storm, flood, corrosion or lack of maintenance. Subsequent damage related to the failure of a vehicle component or accessory not installed by Callaway. Insufficient cooling or lubrication as well as damage due to continued operation in an overheating and/or insufficiently lubricated condition. Improper operation or use including but not limited to use of improper fuels, fluids or lubricants. Vehicle use during or subsequent to use in any type of competitive event or on-track activity whether formal or informal. Other expenses incidental or consequential expenses related to a covered warranty repair are not covered, including transportation of the covered vehicle, lodging, alternative transportation, loss of time, or personal and/or business economic loss. This Warranty does not cover costs for removal or re-installation of any Callaway Components required to perform any GM warranty repairs to the vehicle or other service work. GM engine, transmission, final drive and transaxle components are covered by a GM warranty. In the event that the vehicle manufacturer, GM, determines that a Callaway-installed Callaway Component failure damaged any GM internal engine component(s) and declines GM warranty coverage during the term of this Warranty, Callaway will provide repair or replacement of the powertrain components using new and/or remanufactured GM components at a Callaway-approved facility. If GM declines to cover an otherwise-covered GM warranty repair exclusively due to the increased torque produced by modifications made by Callaway and Callaway agrees with GM findings, Callaway will arrange repair or replacement of certain torque-transmitting components at a Callaway-approved repair facility. Callaway reserves the right to inspect the alleged damage prior to the commencement of repairs in order to verify GM findings. This provision will apply only when Callaway agrees with GM findings. Otherwise, the consequential damage exclusion will apply. All other terms and conditions of this Limited Warranty apply to this subsequent damage exception. This Limited Warranty applies to certain internal, lubricated components within the engine and transaxle assemblies as specified below. This policy does not constitute a warranty on GM components. Any components that are discolored from heat and/or scored or otherwise damaged due to insufficient lubrication are not eligible. GM clutch, pressure plate and flywheel components are not eligible. Driveshaft components and axle shaft components are not eligible. Callaway does not authorize any other person or entity to create for it any other liability or obligation with respect to Callaway-Installed Callaway Components and or this Limited Warranty. Any implied warranty of merchantability or fitness for a particular purpose of Callaway-Installed Callaway Components is limited in duration to the term of this Limited Warranty. This Warranty gives you specific legal rights and you may also have other rights that vary from state to state. Some states do not allow limitations on how long an implied warranty may last or limitation of consequential damage so the above limitations or exclusions may not apply to you.